It appears that good news is on the horizon for SNAP recipients. Communication from the State FSSA office last Monday indicated that a plan had been approved by the USDA/Food and Nutrition Service so that half of SNAP benefits could be issued beginning February 22nd and the other half could be issued on the regular March staggered issuance date. This approval is welcome news for SNAP families who have been waiting in limbo for a decision that would provide benefits to them for a least another month. 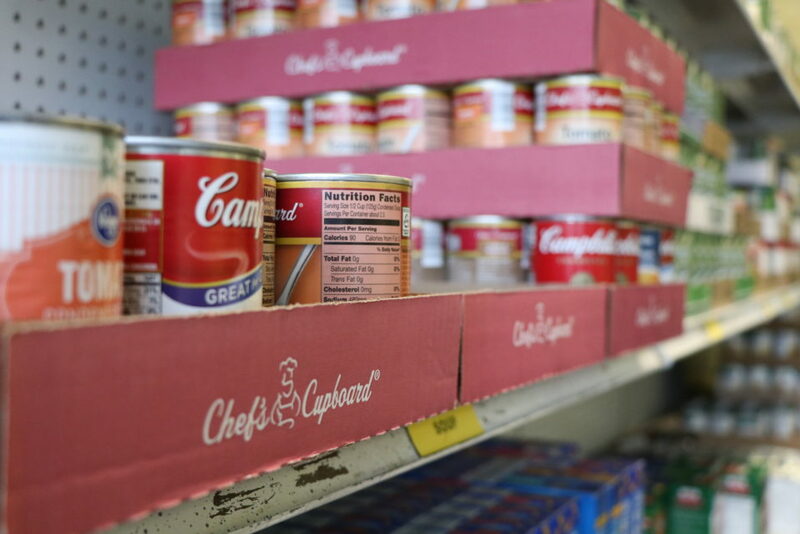 At this point, month to month is better than no decision that would cause a significant gap in stability for many families with few options for food. Over the years, many conversations with members of the general public get to the question of our funding. Some have expressed that they thought our organization was funded and owned by the government. We are not, never have been and most likely, never will be owned by the government. We’re a member of a national network of regional food banks in an organization called Feeding America. The Feeding America office is an organizing body for communication, food sourcing, coordination between member food banks, advocacy, food safety and much more. Feeding America owns no trucks, has no drivers or any food inventory, but is a vital connector for all that and many other resources. They’re located in a couple of floors of offices in downtown Chicago. Grant opportunities to the membership are available through corporate relationships they develop on our behalf. Our national network of food banks are essentially a group of over 200 independent operators who must operate under best practice industry-based general guidelines for compliance with our contract. We’re closely audited on a bi-annual basis with a 2 day visit in our facility and meeting with our board of directors to review the report. Our next audit will be in March, 2019. As to the government funding, yes, we have a small dollar contract with the USDA managed through the State Board of Health to distribute the TEFAP government commodity purchases. This contract is about 4% of our annual budget and represents 20% of all the food we distribute. This is significantly under-funded, but that’s not really new. We are also prohibited from asking the agencies who receive the TEFAP products from us to pay a fee to receive it or a fee to deliver it to their door. The product is good and is a big benefit for the end user, but the financial model leaves a lot to be desired. All that said, so who are the owners of Second Harvest, since it’s not the government or Feeding America? You are, the general public. And, we love to have owners come to our facility and see what they own! Can you imagine owning a local business and never visiting it to see and understand what you have invested in? We’re spending more time today than I can ever remember reaching out to our investors to invite you in for a tour. Our Donor Relations Manager, Dianne Hovermale and I are always excited to have the opportunity to connect you with our whole team and have a conversation as we tour to explain all the ways we’re engaged in this 8 county region. We also place great value on your time investment as well. Our Volunteer Coordinator, Kellie Arrowood is anxious to connect you to ways you can personally get hands on with the many community efforts we have going on. Please don’t hesitate to accept our call, contact us at 765-287-8698 or curehunger.org and take us up on the offer to visit what you own. Hopefully, by the time this is printed, the government shutdown will be over. Feeding America, our national affiliate, has been very busy with communications to Congress regarding the impact that is being felt and what an extended time frame for the shutdown might mean for tens of millions of families living on the edge or well below the level of self-sufficiency. There’s an old proverb that goes something like this – When elephants fight, the ants are the ones who pay the price. Ants, individually, are less powerful than elephants, but given the size difference ants are much stronger than elephants and are well known with their ability of working together. This reference is not intended to direct any negativity toward either political party, but as an encouragement toward both to remain in conversation, be open to ideas that may lead to a broader range of topics which could lead to some compromise with points both could claim victory. The all or nothing approach seems to further divide our country. On the ground, reality as of last week looks like SNAP benefits will be paid to current recipients for the rest of January. All the February benefits will be loaded on the cards in late January so the recipients will need to budget them for the entire month. March benefits or funding is to be determined, but not known if it will be available at all at this time. The TEFAP, (The Emergency Food Assistance Program) which is the old “government cheese” program, now a product line of 30-40 items, will have food continue to flow to our warehouse for distribution in all our 8 county service area through February. The product line is about 15% of our total distribution. The difficult news for us is the government will not be providing the funding for the work even though we have a contract. Beyond February, it’s anybody’s guess if this program’s food or money will be flowing back into the pipeline. These circumstances are adding pressure to a large group of families who already have a lot of pressure to make ends meet. It is also putting people who have been self-sufficient into a circumstance of needing assistance to feed their family even if the circumstance is short-lived. A recent study commissioned by Fifth Third Bank found that 47% of all families in the United States are living from paycheck-to-paycheck and 63% don’t have the savings to cover a $500 car repair. That means roughly half the total population of our community would find an unexpected car repair enough to cause a financial train wreck. This may not hit home to me until it impacts me or someone in my family. It seems that the current limbo status of programs offering limited short-term relief would generate significant concern and lead to a lot of communication to federal elected officials. When enough people or ants start talking, I think all the elephants may listen. Public pressure may decide this outcome. Have you ever heard the phrase –“I’m as excited as a kid at Christmas”? In this line of work our team engages with families facing lots of circumstances that are difficult and uplifting. 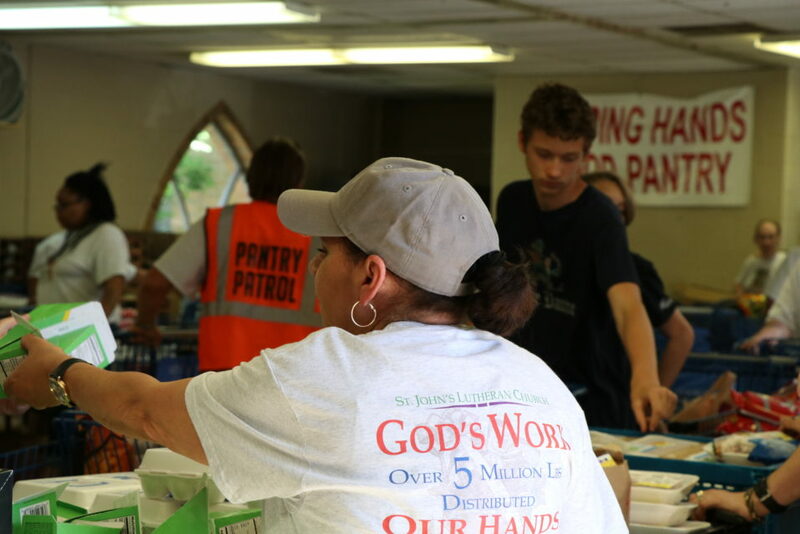 We are working at full speed to get as much food out the door as possible to over 67,000 struggling people who need this assistance. We see gratitude and thankfulness from people which is exciting. We see first-hand, up close and personal through our Forward S.T.E.P.S. initiative engaged families who are committed to positive change toward self-sustainability. These are hard working families who are challenged to make ends meet, better known as ALICE families, (Asset Limited, Income Challenged, Employed) who commit to SMART goals and work with intentional community relationship partners from Middle Income and/or Wealth with mutual accountability goal-setting. The exciting part is that progress is being made! This year we have had 53 youth enrolled in our enrichment program, 13 Empowerment Leaders earned raises in their jobs and 4 leaders are new home owners. That is exciting! We are also excited to finalize the re-branding of our School Pantry Program (I have decided that was the worst possible name that I could have come up with some 2 ½ years ago). This initiative is really focused on relationship building between parents and school staff with the long-term strategy of raising a generation of children that become parents and are involved in their children’s school as a normal activity, because they grew up that way. You may want to read it again because it may seem too simple. Reality is that both you and I do things every day because of the way we grew up. We both also don’t do things because of the way we grew up. Children are influenced in both directions at school, home and their environment (neighborhood), with others as well that I haven’t mentioned. This initiative is all about changing the child’s perception in a positive way as they watch parents and teachers engaging in a growing dialogue aimed at benefitting the child’s educational experience. Parents see value in engaging with teachers and administrators as the relationship grows month after month. Parents and students begin to see school as safe to form and build relationships, one that is friendly and welcoming, filled with partners who are concerned about their child and finally, as a place where they can go to enjoy themselves. Educators tell us that parental participation is significantin the educational progress that the child makes. When the child experiencesthis reinforcement over time their focus improves. This initiative is aimed ata better educational experience which can lead to broader employmentopportunities as an adult. This is our long-term strategy aimed at breaking thecycle of poverty (shortening the line of need) and dependence on assistanceprograms for them and their family. Our data gathering is in its first year andwe are excited about what we are learning. We will continue to gather the dataand share the findings as we go forward. It’s always exciting this time of year to read my email or pick up the ringing telephone and engage with an excited person who wants to get knee-deep in our mission. There are many creative approaches that people come up with to address the challenges faced by thousands in the local community. As new developments continue to be rolled out through technology advancement, the business community and even individuals shopping on-line can just click and a donation can be made by the business to the buyer’s favorite charity. Such is the case for AmazonSmile. For over 2 years now, if you are planning to order through Amazon, you can visit smile.amazon.com to easily register to have 0.5% of your purchase price to be donated by Amazon to your favorite charity. A year ago we were experiencing low inventory levels of non-refrigerated food. The downward trend of less donations in this type of product has continued and is the long term forecast from Feeding America. Savvy warehouses and retailers continue to improve on shrink control which lowers the amount they have to donate to food banks. It’s good for them because it improves their bottom line and that’s what they’re in business to do, but it puts more pressure on food banks to find the products needed to assist struggling families. The longer-term answer is that more of our inventory and distribution will come from perishable food, both refrigerated and frozen, primarily fresh produce. This is a good, but challenging prospect. This product line is a wonderful source of healthier choices for families, but it puts pressure on families refrigerated storage capacity which is sometimes very small. Produce also has higher costs associated with getting it than the non-refrigerated products have. As an example, getting the donated produce picked, washed and packaged can add additional costs of around $.24/lb. for apples over and above the trucking cost to get it to our food bank that may run $.04-.08/lb. already. That means those “free apples” may cost $9,600 plus $2,000 in delivery cost for a semi-load to our dock. Freight costs have continued to rise across the country as more loads of all types of freight need moved with less available drivers to move them. More refrigerated products are also pushing our capacity in cooler space. This is a daily topic here and will be for the foreseeable future, but we need to keep pushing for more progress. The storage question can be answered by expanding our present cooler. We’re now doing our information gathering for the expansion of our cooler and our freezer. Some immediate, but also challenging good news is that we are now getting fresh milk in truckload quantities delivered to us as part of the TEFAP program (The Emergency Food Assistance Program) that comes from the USDA. This is scheduled for the next 6 months and may continue coming in the foreseeable future, depending on decisions by the federal government. I could not be more proud of our staff. They are a small group of dedicated, caring people who come here and do amazing things every day. Over the last 3 years, we have stretched ourselves beyond where we have traditionally been. We have morphed into areas of programming that are aimed at identifying the root causes of hunger and poverty as our top priorities. We are focused on relationship building to drive change for ALICE families (Asset Limited Income Constrained Employed) who seriously want to achieve a level of self-sufficiency and break the cycle of poverty. This longer term programming is a multi-year, slow burn approach that has the potential for families to make changes in their own lives that will have a generational impact to shorten the line of need. We are committed to providing short term, emergency hunger relief FOR families (Help for Today), but are working very hard in these new program areas to engage WITH families (Hope for Tomorrow), in positive relationship building that will bring about lasting change. This carries over to the next generation and can establish a “New Normal” that can be lived out without the need for social safety net services. It is achievable and by partnering with you we remain enthusiastically optimistic about the future. I can’t think of any non-profit organization that isn’t in full blown “attention to detail” mode at this moment. At Second Harvest, we are quickly moving toward the completion of our 2019 budget and our internal planning discussions are turning to the first quarter focus. Don’t get me wrong, we still have a lot of tasks to complete to finish off 2018 as planned, but, those plans were made many months ago. We had a great, sunny day on October 1st for our 8th annual ACC Fall Classic Golf Outing. Our sincere thanks go to the leadership and all the supporters from Ultra Steak (aka, Texas Roadhouse). On Saturday, October 6th, we held our 4th annual Hot Rods for Hunger event at the Muncie Mall, where we had over 180 cars and 6 motorcycles on display. We even had someone from Ohio come to display their car. We want to offer special thanks to Mutual Bank as our Presenting Sponsor and to Muncie Mall for their partnership in hosting this event, again this year. On Saturday, October 13th, we were in Elwood with our friends from Red Gold, participating in the 7th Annual Run to Crush Hunger and 33rd Chili Cook-Off. Red Gold outdid themselves again this year and had a record attendance of over 1,400 registered participants for the 10K, 5K and 1 mile events. I would say the Second Harvest team finished strong, but let’s just say we finished without injury. The Chili Cook-Off was executed flawlessly and it had to be a record attendance as well. Monday, October 15th, we participated at the Hoosier Park Fall Fair to showcase our program work in Madison County. Tuesday, October 16th we had our School Pantry Program at 3 schools in Madison, Delaware and Randolph counties. Wednesday, October 17th we were at 3 more schools also in Delaware, Henry and Wabash counties and held a Tailgate in Jay County. Thursday, October 18th at 2 more school pantries in Henry and Delaware counties and hosting our Forward S.T.E.P.S. evening meetings and meal for approximately 60 attendees. Friday, October 19th in Randolph and Henry County with the Tailgate Program. The time has also come to celebrate opportunities and voice concerns so we can address the needs of as many in the community as we can reach now and in the future. So on Tuesday, October 23rd, I will be making some comments at a press conference hosted by Midwest Food Bank in Indianapolis. Here we will announce the launch of Food Drop as a statewide initiative. 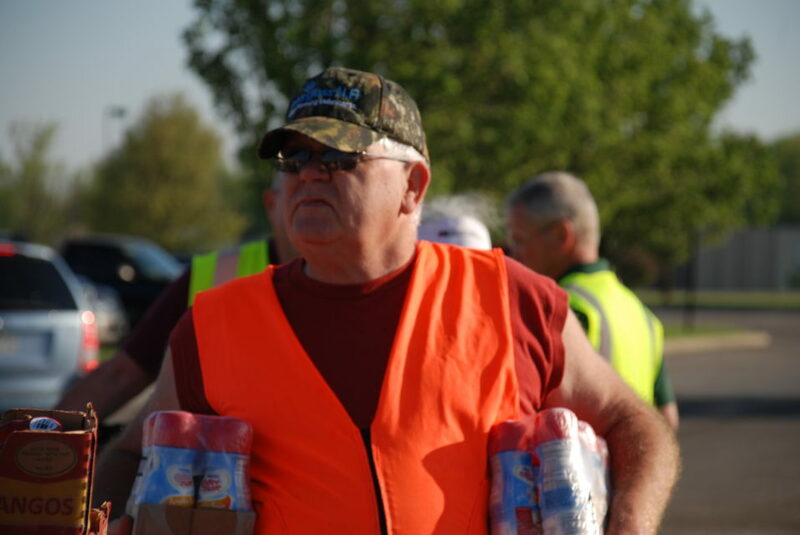 This effort will make it much easier for trucking companies to contact any participating food bank to drop partial or full truckloads of food they need to off load anytime 24/7, so that the driver can keep going to the next stop. We anticipate this to be a new source of donated food or at least be a more convenient system for logistical companies. Wednesday, October 23rd, we will be hosting a breakout session during the 3rd Annual Local Food Summit for Muncie and East Central Indiana hosted at the Ball State Alumni Center. This event is another way for anyone and everyone to get involved in the local and regional food system, cutting-edge innovations from food and farming entrepreneurs to help shape our local food landscape through policy, planning and action (as the electronic invitation indicates). Wrapping up October, we will host our 3rd Do Good Date Night at our Second Harvest facility on Friday, October 26th. Come by yourself, with a date or in a group of friends for only $15 per ticket! Harmony Café will be catering the meal, there will be a cash bar, and lots of fun activities in our community room. Valuable information will be given about what we are doing in our communities and how you can be a part of making it happen. For tickets, visit Eventbright.com – DoGoodDateNight. We are always looking for people/organization/businesses who want to partner with us in any of these impactful ways to lift up the community. John and Mary waited over an hour for the doors to open. They could see people inside getting things ready. It was still misty and they didn’t have an umbrella. John pulled up his hood and Mary luckily remembered to bring her hat. As they waited, others were assembling outside with them. They felt lucky that the rain had almost stopped. The grandkids kids were in school so it made their trip less like a juggling act between weather and waiting. The kids have trouble waiting and the rain would make them even less patient. Mary knew the kids would be hungry when they got home but she was confident they would all eat tonight because of the food they would get this afternoon. John was thinking he might try to contact his old employer to see if they might have a few hours a week that he could come in to work. It had been about 6 months since he had been employed there. The news that his job was eliminated just about crushed him. He had some limited mechanical skills and many in the neighborhood called on him for help when they had a need so he managed to make a few bucks. He and Mary had been pretty self-sufficient until his hours began to drop about a year ago. The kids, ages 7 and 9 came to stay after their parents had gotten in some trouble. It took 3 months for John and Mary to be granted custody, but the last 8 months have been much better for the kids. They were now in school on a regular basis with improving grades. Getting home just before the kids got off the bus, Mary was able to put away the two bags of food they had received. There were some items that she would be able to use tonight to round out her meal ideas. A small bag of individual chocolate milk cartons would be enough for the kids to each have one for the next three days. She smiled as she thought about how surprised they would be and how they would beg her to let them have more than one. Mary had a small garden with a few tomato plants that were producing pretty well this year, so with the bacon she got from the store and the head of lettuce and loaf of bread she just received, it would be BLT’s tonight for sure. She was glad the kids liked tomatoes. One sandwich for everyone would be a pretty good meal. John got an unexpected call back from his old employer. Someone had to have surgery and would be off work for 2-3 weeks. John would be able to work about 20 hours each week until the man was able to return. It wouldn’t make life easy, but now their electric bill wouldn’t be late. The juggling act at the end of the month would be a little less challenging barring any new surprises, but there always seemed to be one when they could least absorb it. John had been gifted with a beautiful voice and would be anxious to share the good news about his temporary job with his fellow choir members. His voice always lifted Mary’s spirits when he would sing around the house. This day would be another good one for them to remember and she was confident there would be some singing tonight as they looked forward to him going to work next week. This day was no different than many other days for thousands of people who are struggling to make ends meet by doing things as best they can for themselves and the people around them. Our organization strives to empower people by providing some limited help for today and hope for tomorrow that will lead to long term stability. 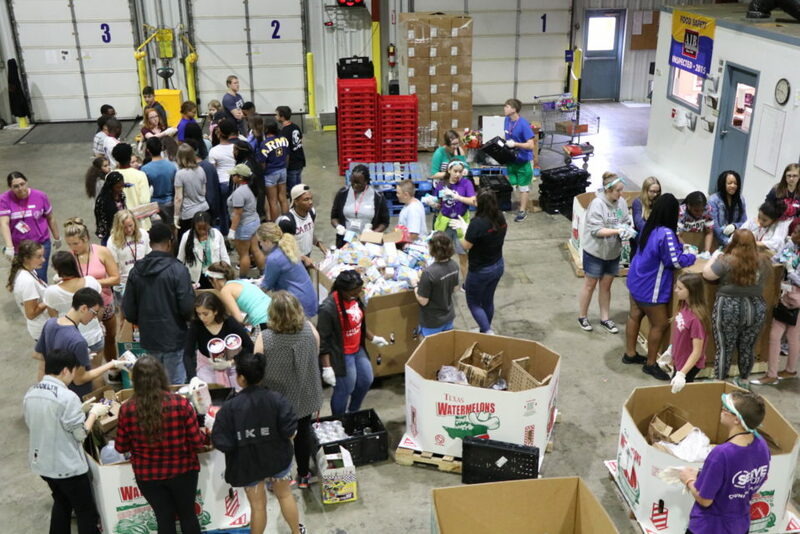 How do 26 medical students connect with our food bank? This is the 3rd year we have engaged the class of 1st year medical students enrolled in the I.U. School of Medicine, I.U. Ball Memorial Campus. Derron Bishop, PhD, Associate Dean and Director along with Michael Litt, PhD, Associate Professor Medical Genetics have reached out to us to engage these students as part of their Service Learning Transitions 1 focusing on Health Care Disparities. August 10th, Dorica Watson, our Community Engagement Manager and I spent 2 hours in their class room to share with them some insights with poverty, food insecurity, prospective and relationships between wealth, middle income and poverty populations. We discussed our relationship with Feeding America, the national network with a reach of regional food bank touching every county in the U.S. As we moved through the discussion, the idea of what can they do and/or expect to see as doctors was shared as well. The ER is busy with lots of circumstances of people in poverty waiting too long to seek medical attention or running to the ER for every incident that may have been treatable through a family physician if they had the money to see one. We finished our time together in the class room by engaging them in a poverty exercise to see how well they could navigate a month with unpredictable circumstances of life happening while possessing very limited resources. It sorely challenged them. The group of 26 visited our facility on August 13th for more interaction and a deeper dive into the poverty topic. 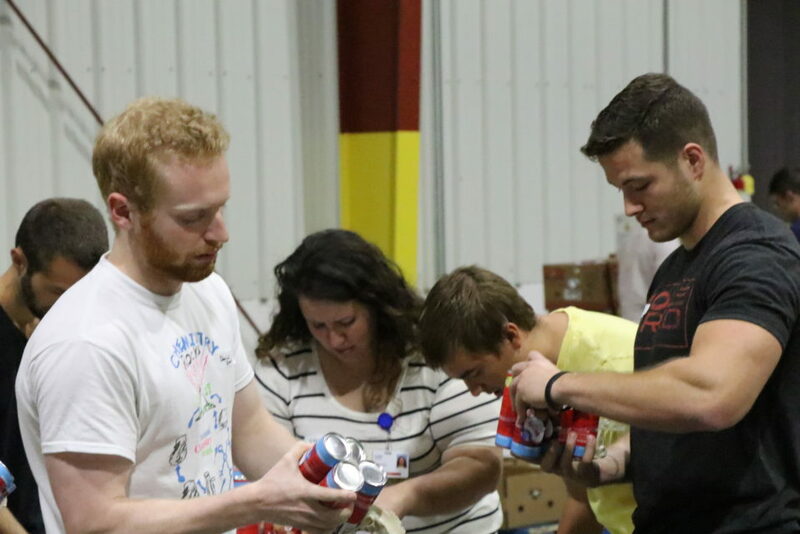 After a tour, they got hands-on with helping us sort and package food products for distribution through the pantry system and other programs. We also engaged them with a training exercise we offer to the community that asks them to pair with another student and navigate real life circumstances that a “family” in poverty could face. The last formal engagement with the students will provide them time to debrief about their experience through several presentations they will make to our team. Last year’s class spoke about how the information and hands-on experience gave them a better appreciation for the work we do, but also the life circumstances of a population that many of them will encounter professionally the rest of their working career. As school is staring again, our rollout of new School Food Pantry Program continues. Between now and the end of 2018, we will have 5 more schools engaged in this relationship building program. This will take our total up to 28 schools in 7 counties. The acceptance of this program has been very strong. Teachers are meeting and greeting the families they are now seeing on a regular basis. Schools who previously had parental interaction with parents in the single digits are now seeing hundreds of people on a regular basis. 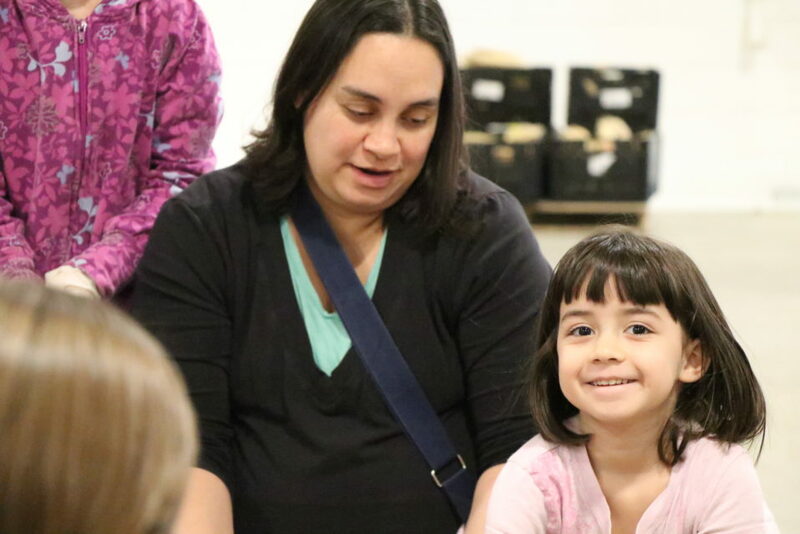 One school has been able to re-organize a parent- teacher organization with parents leading the way. Another school principal emailed me and said this program is the most positive thing he had experienced in 13 years as an administrator. 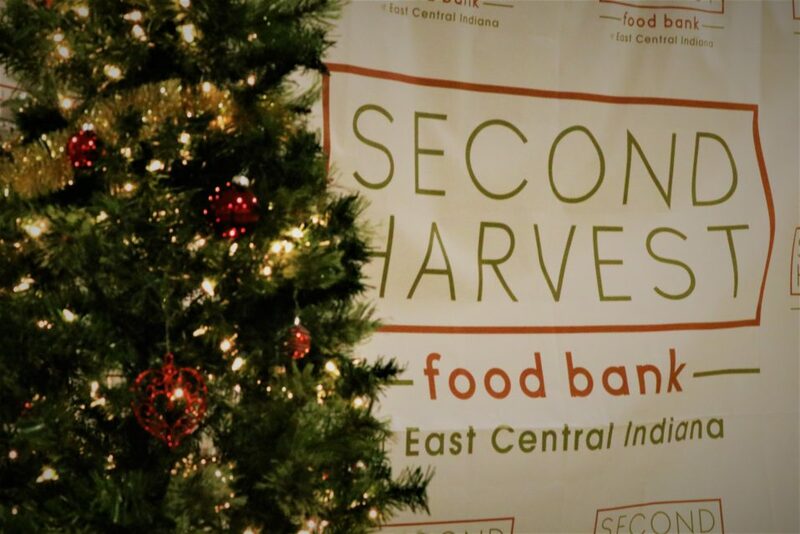 Tim Kean is the President and CEO of Second Harvest Food Bank of East Central Indiana. The Second Harvest Food Bank network of 115-member agencies, programs and 23 schools provide food assistance and self-sustainability skills to more than 67,000 low-income people facing hunger in Blackford, Delaware, Grant, Henry, Jay, Madison, Randolph and Wabash Counties. One of the teamwork exercises I experienced in two different leadership academy programs I attended is getting into a circle with six other people and pointing both index fingers toward the person across from you. Then bend your knees and place a hula-hoop horizontally in the middle of the circle supported by all the fingers, then attempt to raise it up horizontally while everyone in the circle begins to stand up together. Everyone moves at a different pace and a different way and that’s where the challenge begins. I’ve been a firm believer that there are many ways for 1+1 to equal 3, especially working in communities. But, I am also a believer that 3 X 3 = 9. Sounds too simple, but if we are traveling toward a destination in a row-boat, if you and I will pull the oars together, we will arrive sooner with less effort than if we row independently. I think the same is true if we find one or two more to join us and we all are pulling the oars in unison, it can mean we might have more rapid progress with again the same effort. That can mean that we all need to be willing to sacrifice some individuality for the greater good of the group and that is where the effort can become stalled or we wind up traveling in circles, not closer to the destination. We will be rolling out our new strategic plan for the next 3 years by the end of this month. 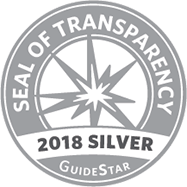 This will guide our thinking, efforts and resources with all the aspects of our organization. Reviewing the definition of how we describe who we are and what we are going to do does not happen over a cup of coffee, but lots of viewpoints from the community and internally with yes, several cups of coffee. We must be in relationship with many others in order for us to make every pull on the oar count for as much as it could. This valuable exercise helps us consider where to step on the gas and maybe where we need to let go of baggage we are dragging just because we have been doing it for several years or decades as the case may be. This month we are celebrating our 35th anniversary. We have some wonderful organizations, Mutual Bank Charitable Foundation and The Kroger Co. who have stepped up and awarded us with a total of $35,000 as a matching opportunity during July and August. So every dollar donated can turn into 2 dollars of impact during this 2 month period. Over 35 years this organization has changed a lot. From various methods we have implemented to get food out to struggling families to our latest development with a holistic approach working with families in long-term relationship building that will break the cycle of poverty. We would like to have new conversations with businesses and organizations to help strengthen the community efforts that are currently being executed. These holistic efforts need the 3 “T’s” -Time, Talent and Treasure to equip motivated families from the resource pool toward lasting change that they create. Reach out to us to see how we might pull on the oars together and make 1+1=3 a reality, better yet 3 X 3 = 9. Tim Kean is the President and CEO of Second Harvest Food Bank of East Central Indiana. 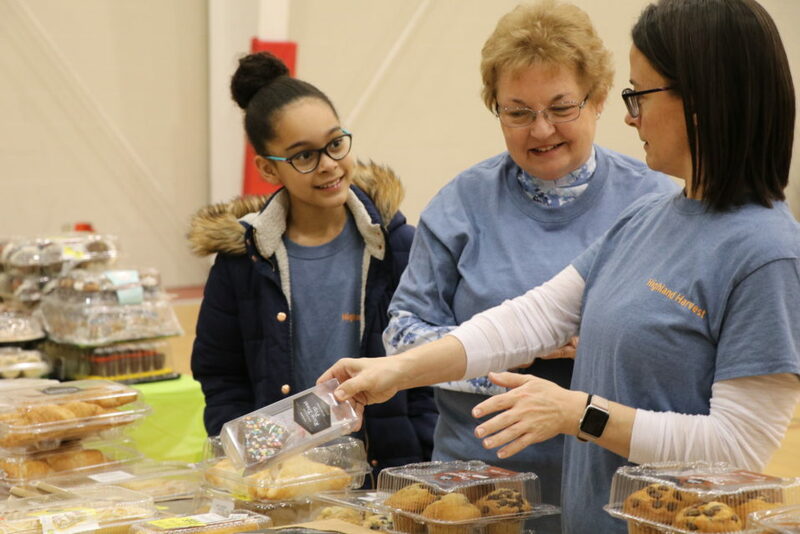 The Second Harvest Food Bank network of 115-member agencies, programs and 22 schools provide food assistance and self-sustainability skills to more than 68,000 low-income people facing hunger in Blackford, Delaware, Grant, Henry, Jay, Madison, Randolph and Wabash Counties. My granddaughter is ready for a bigger bike. She lost her training wheels about a month ago. I told her a couple of weeks ago that we would go get a new bike very soon. I’m looking forward to seeing her ride that new one, but am anxious about when the inevitable will happen, that first crash. I don’t really care that the bike might be scratched, that will continue to happen as long as she has it. I’m more anxious about her hesitancy to get up and get back on the bike. That’s a big life lesson. As you know, we all continue to learn that lesson throughout the rest of life in one way or another. I look at her accomplishment as kind of a milestone as she transitions from what was comfortable, to what is new and exciting, maybe a little scary, but time for the next step to be taken. She will continue to grow and the need to make these milestone changes will continue. Isn’t that true for the rest of us as well? We are finishing up our new Strategic Plan for 2019 – 2021. It should be ready by the end of July. We will probably activate it in August because we’re ready to embrace it and move forward. Strategic Plans are somewhat of a milestone activity. It’s good to re-examine what we’re doing and why we’re doing it. It also is good to move into a possible new aspect of the mission or to add more depth and breadth to what we’re committed to with programs and initiatives. It may seem to have a scary side, but that probably has more to do with reaching beyond our current grasp to lean into the future of what we’re striving to achieve. We certainly don’t work in isolation, we do this with the help of thousands of community members that cover 8 counties who continue to place value in this mission. I think that demonstrates the genuine concern that exists for struggling families that make up a significant portion of the population. A recent training I attended shared that 78% of Americans are living paycheck to paycheck. Also, that over 50% of Americans can’t find $500 to meet a crisis. If you find that startling, it shouldn’t be. We are actually doing better on many struggle points than in recent years, so there’s reason to be optimistic. I am excited to be part of this great work. I think the work we do and through many other people is noble. Gathering resources (food) that would be lost to the local landfills across the country and getting it re-purposed into beneficial supplements to ease the pressure of an economic crossroads crisis is impacting tens of thousands of families in our 8 counties, if only with some short-term relief. Who benefits if we allow it to be dumped in our landfill? We in essence are helping to cultivate relationships that are changing lives through our Forward S.T.E.P.S. initiative and our School Pantry Program. Hearing someone witness to the impact that these programs have had on their lives and the lives of their children is motivational to say the least. If an employer has recognized a difference in an employee that has resulted in a raise, promotion or just some recognition to boost that employee’s morale we can celebrate the work and encourage the journey to continue. When children are demonstrating positive behavior and are engaging more in the classroom we can celebrate the work. These results are from relationship building. Many of our community partners help us facilitate these building blocks that are foundational to sustainable change, one family at a time. That may not sound like much unless you’re one of the families. We have a great staff team that take their role seriously because lives of people are being affected. We celebrate the work, just not often enough, and invite you to join us for the role you feel called to fill. Together, we can see this community take the next step.